» About our alleys: More than a shortcut? Between First and Second, this alley connects Lyon and Ellsworth streets, then keeps going west. On the subject of alleys, like on almost everything else, Wikipedia has a lot to say. Look it up. There are plenty of examples around the world of alleys that offer pedestrians something to see, do, or buy. Could that be done around here? Probably not to any large extent. And certainly CARA has shown over the past 18 years that it’s not interested in pushing this part of its plan. But if property owners had an interest, maybe one or two of the downtown mid-block passages could be turned into business assets rather than places most people would rather avoid. Albany’s alleys are the wart on the nose of the city. Just make everything around it look nice and no one will notice. These alleys haven’t been tended to for 40 to 50 years! They look better than some of our streets. 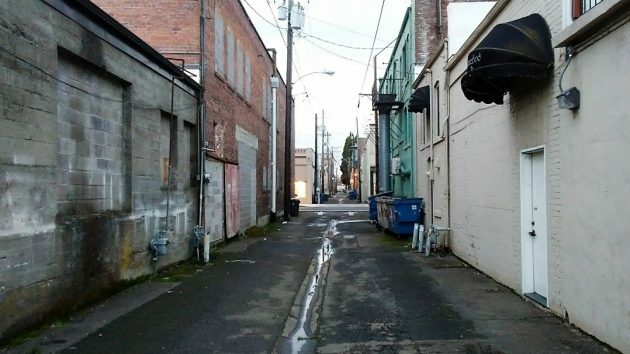 Salem has some businesses that are alley access. While there had been some beautification in installing some sculpture art, it didn’t take off. They are currently working on ideas on making them more accessible and usable. One idea is giving them individual names. One famous alley is Burritt Alley in San Francisco. Aficionados of The Maltese Falcon know that’s where Miles Archer, partner of Sam Spade, was killed by Bridgett O’Shannessy. It has been a popular tour spot for over 50 years, and it was all from a fictional novel. Inspiration sometimes has great payoffs. Of particular note is the wafting odor of rotting foodstuffs dumped unceremoniously into garbage cans parked in alleys behind downtown restaurants. The redolence emanating from these rat-infested receptacles is the most unappealing balm. The distinctive bouquet makes a journey down those dank, fetid places most unpleasant. Not for the faint of heart. Leave the alleys alone. It shows the history of Albany over the past 100 plus years. Few alleys stimulate attention. Most are service-ways for utilities. (Once upon a time that included biowaste). They keep the detritus from customer view. A lingering memory of the NOLA French Quarter is trash, containers, needles, and barf beside the sidewalk. Not going there again.